BARGAINMAX LIMITED Shopkins Guess Who? 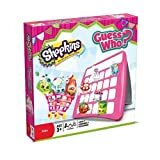 The classic guessing game meets the world of Shopkins! Packed with 48 different colourful characters from Season One to choose from, can you guess where Gran Jam loves to hang out? Who D'Lish Donut's BFF is? What Lippy Lips favourite hobby is and who the exclusive and limited edition characters are? Is your Mystery Character wearing glasses? Does your Mystery Character have a beard? Is it Lippy Lips?